While some of us relish the opportunity to stand up and spout our opinions on a subject, others break out into shakes and cold sweats and no amount of “imagine them naked” or “just breathe” will help. I’ve been giving and helping with presentations like these for about nine years now. 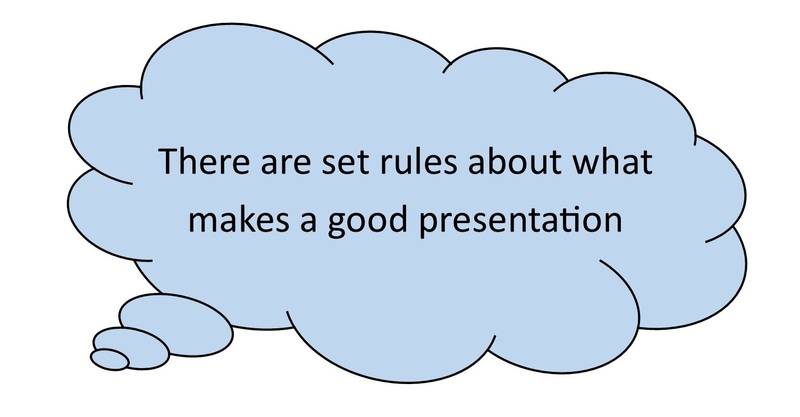 I certainly don’t know everything there is to know but I do want to try and dispel a few presentation myths to help you serve up a confident and engaging presentation. Use visual aids but don’t use too much text. Don’t turn your back to the audience. Don’t speak too fast. Make eye contact. Don’t just read from the page. And on and on. Each of these rules may serve a purpose. 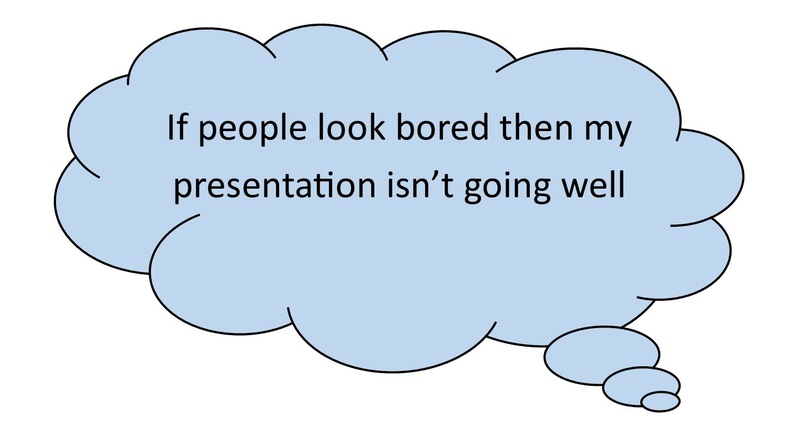 Being able to do them all may well make your presentation better. But nobody can do everything, everyone’s different, and, ultimately, you have your own personality, your own presentation hang ups, and your own strengths. If you can’t project then get a microphone. If you’re a serious person then be serious and don’t worry about cracking jokes. If, like me, you’re so passionate about your subject you talk like you’re on a caffeine trip then make sure you repeat your key points. Don’t beat yourself up if you’ve heard of a presentation rule that you can’t stick to and don’t lose your personality trying to get round it. At a recent conference I was so excited for the keynote speech that I practically skipped down to the front row to take my spot with notepad and pen at the ready. But with a lunch of twenty triangle sandwiches happily gurgling away in my stomach, the sun gently warming the back of my neck through the window, and the baritone voice of the speaker soothing me, within ten minutes I had nodded off. I was mortified. But what could I do? Not a lot. What could he have done? Not a lot. You might set a group task as a tactic to keep the audience engaged, simply ask them to stand up and sit down, or find a reason to make a loud noise every now and then. However, if you look out into the audience you may still see some closed eyes, people starting out the window, or a huge yawn… don’t take it personally. Have you noticed how some presenters say this at the start but when a hand goes up they’re actually a little bit surprised? And if a few too many hands go up they quickly retract the invitation because they hadn’t actually factored in time for the questions they’d said they were happy to take. Don’t be this presenter. 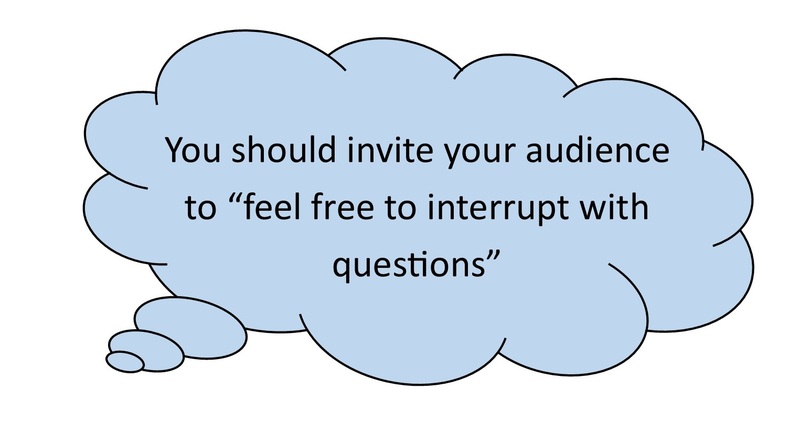 If you have a lot of information to get through then just say that and say that questions will have to wait until the end (if at all) or create designated spots for questions and discussion. If you don’t mind questions mid-talk then plan your talk as if you’re going to be interrupted all the time and have plan A, B, and C depending on how much you get asked. Consider that some audience members may be too shy to actually ask questions and just because they didn’t ask doesn’t mean you can assume they understood everything. You need to create an environment where they feel comfortable actually interrupting you or putting their hands up for clarification. If there are points you really needed them to understand, for example, circle back to them and let your audience chat in small groups about the point. Suggest they come up with questions, which they can write down as a group. Hopefully, knowing these 3 presentation misnomers will make you more confident in your presentations. Share any other presentations experiences or tips in the comments. Happy presenting!